In his bedroom 18-year-old Dylan Sanglay surrounds himself with greatness. "All of these are people I aspire to be," Sanglay said. "They inspire me." Covering the walls are great athletes, great quotes, and his dream board. *I knew there had to be a purpose. I didn't want to be any other person just selling clothes. Just another guy selling t-shirts." But it's in another room in his family home where all that vision is realized. A year ago he started Dsigner_etc . He sells mostly used trendy clothing on social media sites. "Then he would come home and he has $20," she said. "And I'm like where did you get that money from? And he'd say 'oh mom I sold those lollipops for a dollar'." A conversation with his younger sister about two homeless men changed his business model. "She was actually kind of frightened," he said. "She was actually kind of scared. I didn't like that kind of vibe." Instead of tossing out clothes he wasn't selling, he gave them to the homeless. "As time went along and I continued to keep doing it she realized the meaning of it." 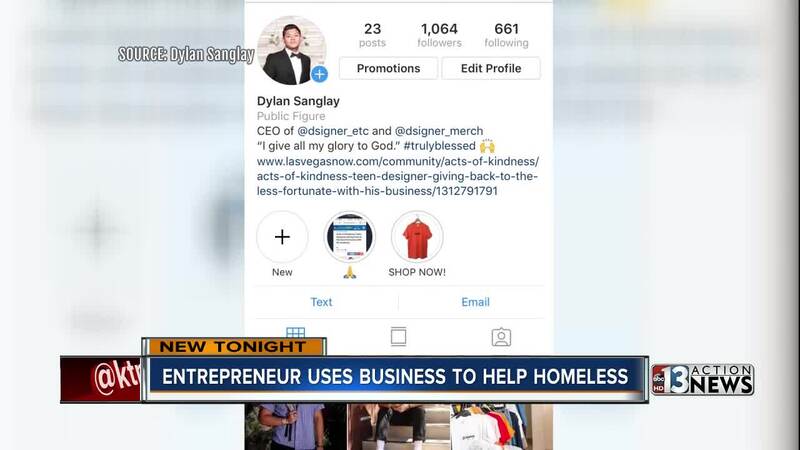 Now a percentage of the money he makes selling clothes is used buy clothes for the homeless. "Anything I can do to help them. That's like the least I can do." Sanglay will be setting up shop downtown at First Friday Las Vegas this week.